The WRP (https://wrp.gov/) is a government-wide recruitment and referral program that connects federal employers nationwide with college students and recent graduates with disabilities who are eager to prove their abilities in the workplace through summer internships or permanent jobs. 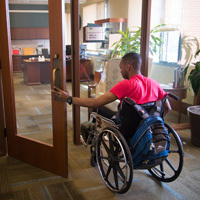 The goal of the program is to increase the representation of persons with disabilities, especially severe disabilities, in the federal workforce. During the Fall 2016 semester, trained federal recruiters will conduct personal phone interviews with eligible candidates who complete the application process. During phone interviews, the recruiter will ask about candidates’ skills and potential career paths. Candidates represent all majors, and range from college freshmen to recently-graduated students. Information from these candidate interviews is compiled in a searchable database that is available to federal Human Resources Specialists, Equal Employment Opportunity Specialists, and other hiring officials in federal agencies. The U.S. Department of Labor's Office of Disability Employment Policy (ODEP) and the U.S. Department of Defense's Office of Diversity Management & Equal Opportunity (ODMEO) manage the program, which continues to be successful with the participation of many other federal agencies. Graduated from Webster after April 2015. Candidates who graduated prior to April 2015 are NOT eligible to participate. If you meet all three of the above qualifications and are interested in interviewing for inclusion in the 2017 WRP database, please register at https://wrp.gov/registerstudent. Registration opened Aug. 29, 2016. Once registered and approved, complete your online application and upload your resume and transcript. If you do not complete the online application, you will not be eligible to participate in the WRP. The deadline for Webster candidates to register for an account and complete the online application is Wednesday, Oct. 12, 2016. Phone interviews will be conducted by WRP recruiters during late October to mid-November 2016. Candidate information will be loaded into the employment database in December 2016 and will remain active for one year. Check out www.wrp.gov to learn more. WRP.jobs (http://wrp.jobs/) offers non-federal employers the opportunity to post permanent and temporary positions. Qualified students with disabilities from WRP can then search and apply for these positions using employers’ standard application processes. Please note that WRP.jobs is distinct from the WRP database used by federal employers to recruit WRP students. Students admitted to the WRP database also receive access to WRP.jobs, where they can search for opportunities in the private sector. The WRP.jobs database opens in Spring 2017. For further information, please contact Marcie Schumert in the Career Planning & Development Center at 314-246-7961, marciaschumert39@webster.edu or Cindy Yamnitz in the Academic Resource Center at 314-246-4245, cynthiayamnitz36@webster.edu.